Happy Half-Birthday to m'girl, Izzy! Hard to believe it's been six months since her birth and only six months to go until her first birthday. I feel like the last six months have flown by and that means she will be smashing a cake before we know it! I'm excited for these next six months because babies really grow and develop so much in that short amount of time. By the time she turns a year old she will likely be standing up and maybe cruising along furniture. If she's really brave she might even be walking by then. How exciting! Right now Isabel isn't quite sitting by herself yet. I'm hoping soon she will be. She has started doing the cutest thing with her lips! She smacks them and makes a kissing noise. I love it. If you follow me on Instagram (@KristelAce) then you might have seen a video I posted. It's absolutely adorable. She really is a sweet thing. She still only has her two bottom teeth but she drools a lot! If she's anything like her brother then more teeth will be popping up soon. For now her two little rabbit teeth are just as cute as can be. We introduced her to avocado (not much of a fan) and zucchini (sometimes a fan) and sweet potato (loves it) and banana (meh). She really isn't a big eater so far. She has four bottles a day with 6-8oz each, but will sometimes only drink half a bottle. I figure she will eat when she is hungry so I try not to worry about it too much. She's easily distracted, so I try to feed her in a quiet room when possible, but with Liam running around it doesn't always happen. She takes 2-3 naps a day (depending on how long the naps are) and sleeps okay at night. She recently got over a cold and was having a hard time breathing and sleeping at night. It was rough! It's also not easy getting her on a consistent schedule because we have to pick Liam up from school so she will sometimes fall asleep in the car (it's kind of a long drive) but doesn't stay asleep once I get her out of the car. The OCD in me wishes I could get her on an exact schedule the way I was able to do with Liam when he was a baby, but I just have to let it go and do the best I can. Luckily she isn't too fussy of a baby, but I feel bad when her nap gets cut short because we have to get Liam from school or take him to swim class or whatever. I guess second babies just have to learn to be more flexible and adaptable. She's most fussy in the car. Good Lord, this girl does not like car rides. It's frustrating because there's not much I can do while I'm driving. I sometimes wish we lived closer to Alex's work and Liam's school so we wouldn't have to spend so much time in the car...but again, second children just have to be more flexible. I'm hoping she gets over it soon. So that's the gist on our baby girl at the moment. 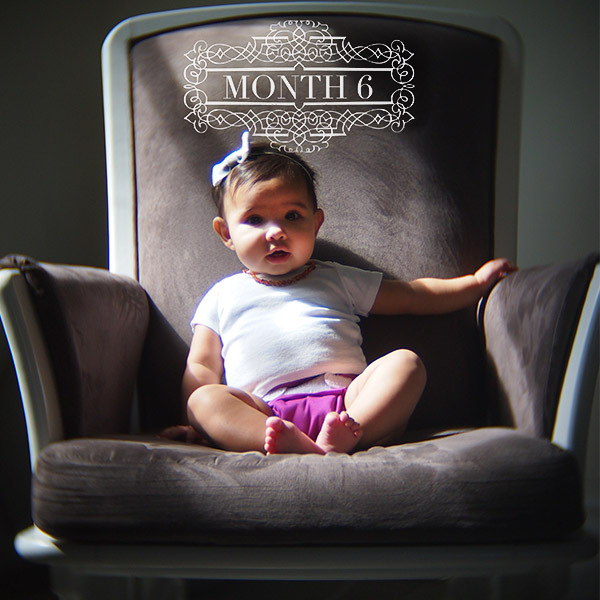 Here is her six month photo.